[ Printed volume. ] Recollections of a Literary Life; and Selections from my Favourite Poets and Prose Writers. By Mary Russell Mitford, Author of "Our Village," "Belford Regis," etc. [ Jane Porter, English novelist. ] Part of Autograph Letter from 'Miss Porter' to 'Monsr. Ventouillac'. On both sides of 7 x 11 cm. piece of paper, cut from a letter. On one side is the address: 'Monsr. Ventouillac | to the care of Master Morgan | From Miss Porter -'. And on the other a fragment of the letter: '<...> that the same volume will be so presented to him, by the Revd Mr. Pole and Mr. Ventouillac. Miss P - hopes Mr. V - <...> success in his <...>'. [The Crossley and Porter Orphan Home and School (Secondary), Halifax.] 67th Annual Report Booklet. List of donors, abstract of accounts and reports. For the year ended 31st July, 1931. Halifax: F. King and Sons Limited, Bowling Dyke Mills. 1931. 40pp., 8vo. Stapled. In yellow printed wraps, with photograph of the imposing school on the front cover. With stamp, shelfmark and label of the Board of Education Library, otherwise in good condition, on lightly-aged paper. No copy in the British Library or on COPAC. 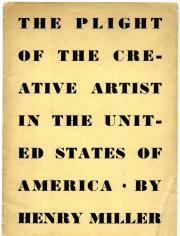 The Plight of the Creative Artist in the United States of America. 8vo: paginated 3-38. Four full-page reproductions of Miller's paintings. In original yellow printed wraps. On brittle, aged paper, with the body of the book detached from the wraps, which are worn and with one corner at front creased. Title taken from front wrap. 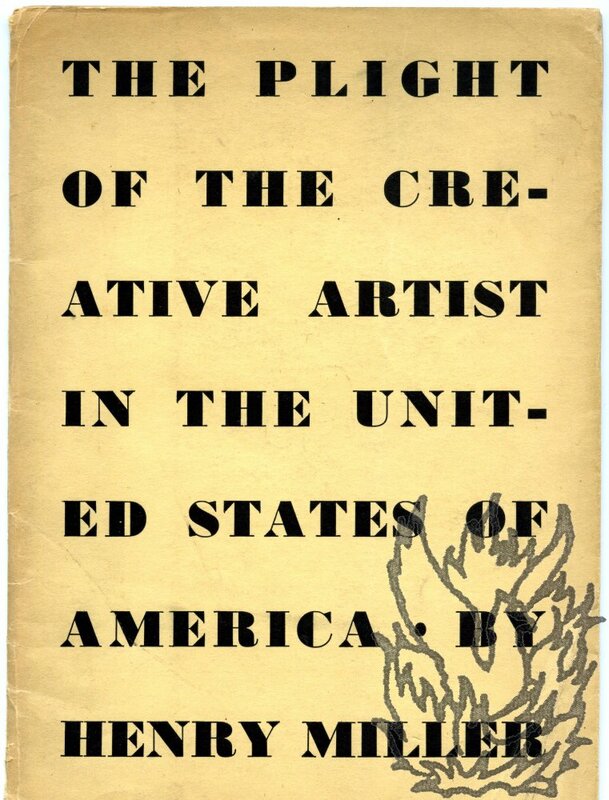 One of 950 numbered copies, signed by the publisher on the final page (beneath 'Publisher's Addendum') 'Bern Porter | 25 South St | Houlton Maine | Copy # 296'. Shifreen &Jackson A37a. Uncommon. Apart from the British Library, COPAC only lists copies at Cambridge, Manchester, Oxford and Bristol.